A plan to improve Information Technology at LA Unified is close to getting every school wireless internet access and providing every student access to a computer. It’s a slower, more methodical strategy than the approach taken by former Superintendent John Deasy, which led to the botched $1.3 billion iPad program, an FBI investigation, his resignation and an abrupt end to the program. The 2015-2016 Strategic Execution Plan proposed by Shahryar Khazei, the district’s chief information officer, will “provide our schools with the infrastructure and equipment they need to teach all the students the skills they will need for success in the 21st century workforce,” he said. Replacing deteriorated cables, switchers and routers and increasing bandwidth at 461 schools. Adding 37 technology aides to give direct support to schools. Providing greater network security at 92 percent of the schools, or 686 of 749. The program doesn’t come without extra costs, paid for by local bond measures and a federal program. The budget increased by $14 million for the Instructional Technology Initiative, and the MiSiS budget increased by $100 million. 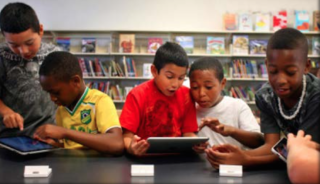 The goal is to ensure that at least 99 percent of the district schools have internet access and full support for tablets, printers, computers, smartphones, access points and more. The plan includes building a shared video solution for schools to store, view and load videos and use video conferencing. And, it will channel information through a secure and monitored server. The IT division is piloting programs at a dozen schools that connect the public address system, telephones, audio visual equipment, intercommunication and notification services to the tech devices, using a single “pipe” that lowers costs to the district. It’s similar to how phone, television and internet access all comes through the same wiring at homes today. The pilot program is at 11 elementary schools — 109th Street, 118th Street, Avalon Gardens, Dorris Place, Garvanza, Kim, Raymond Avenue, Ritter, San Gabriel, Strathern, Wilshire Park — and the Marlton School,. The IT team is asking all schools for a written technology integration plan. It is also conducting a survey to determine the extent that existing infrastructure can be reutilized to reduce future projects’ costs. To date 59 percent of the school surveys are complete. By April, the Instructional Technology Initiative Task Force plans to give recommendations for more district-wide technology programs for next year. The 40-person task force, comprised of principals, teachers, students, parents and tech staff as well as outside business representatives, was formed by former Superintendent Ramon Cortines and is meeting every Thursday to discuss ways to more easily mix technology and teaching. Those meetings are open to the public.